The water by the shore is not shallow. To me and this cobweb of waters. It is a good service . . .
And binds up an ancient love between them. I had watched for a thousand days. For this meeting is under a difficult law. Ezra Pound’s work owes more to understanding of Japan than generally has been acknowledged, and has been more influential in shaping understanding of Japan in Britain and the United States than has been imagined, but even the first of these points requires more than a brief headnote to explain. ‘Getting the Orient from all quarters.’ Ezra Pound in 1909 and some of the ‘quarters’ from which the Orient was making itself known: Laurence Binyon, F. S. Flint, Edward Gordon Craig, Yonejirô Noguchi, Basil Hall Chamberlain, Sadakichi Hartmann, Ernest and Mary Fenollosa, W. B. Yeats, F. V. Dickins, Mary Stopes, and ‘Whistler and the Japanese’. As early as February 1909 Pound was visiting Laurence Binyon at the British Museum Print Room and expressing interest in Binyon’s work on Japanese art (see especially BC34a), and by April of that year he had joined the ‘Poet’s Club’ at weekly meetings in Soho, where according to F. S. Flint the ‘Japanese tanka and haikai’ were much in the air and among the forms considered promising in the aim of revitalising an English poetic that all present agreed had gone stale (A3). During this period Pound hardly could have been unaware of the discussions of Japanese art and aesthetics that appeared frequently in the Times (see BL257), and he would have known of Gordon Craig’s journal The Mask, which from its inception in March 1908 regularly featured discussion of the Japanese theatre and principles of art (see D17). He read Binyon’s Flight of the Dragon (BC9) soon after it appeared in 1911 (see BK18, 140, and 148), and by that summer was in correspondence with Yonejirô Noguchi (see especially D15a). Shortly thereafter Pound almost certainly had read Basil Hall Chamberlain on Japanese poetry (D5, see A51), and perhaps Sadakichi Hartmann’s early experiments with English tanka and hokku (see D12e) and the idiosyncratic studies of Japanese poetry and drama that Hartmann had published in Reader Magazine and the Forum (D12c-d). In the April 1913 Poetry Pound published ‘In a Station of the Metro’, and in the 6 June T.P.’s Weekly his first discussion of how he had arrived at that work in a turn to Japanese poetry (4). Pound met Mary Fenollosa (Ap) in September 1913—probably this was arranged by mutual acquaintance Noguchi—and was in possession of her late husband’s manuscripts in November. That winter, his first with Yeats at Stone Cottage, his work was with Fenollosa’s nô (see especially CB1 and D10), and his reading was F. V. Dickins’s Primitive and Mediaeval Japanese Texts (D3, see BK13a), W. G. Aston’s History of Japanese Literature (D13, see BK77d), Frank Brinkley’s Japan: Its History, Arts, and Literature (D14, see especially BK77g), and Marie Stopes’s Plays of Old Japan (D23, see especially BK152). Pound was ‘getting the orient from all quarters’, he wrote to Dorothy Shakespear in October (BK77c), and in the following months this would continue in fortuitous ways. Noguchi, whose ‘What is a Hokku Poem?’ (D15e5) had appeared in Rhythm in January 1913, and who was preparing the Oxford lectures that John Murray would publish as The Spirit of Japanese Poetry (D15e6), visited Stone Cottage that winter, and through the following year, 1914, Pound worked with the Japanese materials he had found among ‘old Fenollosa’s treasures’ (BK59a). Nishikigi appeared in Poetry in May (BK8), ‘The Classical Drama of Japan’ in the October Quarterly Review (13). In the June issue of Blast (BK10) and the Egoist of August (BK11) Pound allied his own Vorticist aesthetic with Whistler’s conceptions of Japanese art, and in the September Fortnightly Review outlined the Japanese ‘sort of knowing’— ‘super-position’ he called it—that had led him to ‘In a Station of the Metro’, and for the first time (but not the last) suggested that the structure of the nô provided a way to imagine that a ‘long imagiste or vorticist poem’ would be possible (BK12, and see also 17f and 87). Early in 1915 at the Café Royal Pound met the dancer Michio Itô (see especially BL93 and 94), and then Itô’s friend, the painter Kume (see especially BK82c2 and 174a), and they helped in what ways they could, in part by dancing, with his work on the nô. By the following December, when Pound first wrote to his father of the ‘big long endless poem’ he had undertaken (see BK70a), his most important sources of information of Japan were in place. He had turned to them at the beginning of his endless poem, and would do so again and again through the remainder of his life. Pound’s early reliance on the hokku-derived ‘form of super-position’ has become a critical commonplace—critics have argued that even the Pisan Cantos are ‘full of hokku’—but this is not the Japanese form that most instrumentally informs Pound’s work. Some of the effects of all this in Pound’s poetry of the period have been well-documented. By his own accounts of 1913 and 1914 Japanese poetry and art were important models in the development of his Imagist and Vorticist poetic, and the hokku-derived technique of super-position may be traced not only through his poems of this period, particularly those collected in Lustra in September 1916 (20), but also, used in increasingly complex ways, through the body of his work (even the Pisan Cantos  are ‘full of hokku’, Hugh Kenner found in 1951 ). The best account of this remains Earl Miner’s in The Japanese Tradition in British and American Literature (A25, and see also BK100), but that Imagism in general and Pound’s work of this period in particular owe to his understanding of the hokku (or haiku as it is more commonly called now) is acknowledged both in the standard critical studies of Pound (see, for example, BK97, 123, 171, and 188) and of Imagism (see A19, 51, 54, and BK96), and by the end of the century has become a critical commonplace. In spite of the attention given the haiku in studies of the development of Pound’s Imagist poetics, however, it is not the Japanese form that most instrumentally informs his work. For that one must turn to the nô. The Possum’s change of heart: Pound’s nô work is ‘not so important’ as Cathay, and not to be ranked, like Cathay, with Pound’s ‘original work’. 35 years later, in language strikingly like Eliot’s, Hugh Kenner agreed. 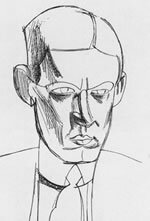 Portrait of T. S. Eliot by Wyndham Lewis. From the beginning critical response to Pound’s adaptation of Fenollosa’s nô manuscripts has ranged from the derisive (BK93a, 177b) to the eulogistic (BK93c, 93g, 194), but generally the work has been regarded an interesting failure. This is an assessment sound enough if the primary standard by which it is judged is the accuracy of the translation itself. Where it is right it is beautifully right, but often it is not right at all, and occasionally it is wrong in grandiose ways. This is a sin usually forgiven Pound’s Li Po, but not often his Zeami, and the critical tendency has been to relegate the latter to a secondary status. In 1917 Eliot found Pound’s nô of considerable value to English literature (BK92b), and was smitten enough with Pound’s discovery of a ‘unity of image’ in the nô plays that soon Eliot was at work on a verse drama of his own that explored its possibilities (see CA10), but by 1918, and more famously, Eliot declared the nô work ‘not so important’ as Cathay (15), to be ‘rank[ed] among [Pound’s] translations’ and not, like Cathay, among the ‘original work’ (BK94). Others concurred, more or less, and then in 1953 the most influential voice in Pound criticism confirmed the discourse, in language strikingly like Eliot’s. The nô plays are ‘somehow less successful’ than Cathay because ‘there is less of Pound in them’, Hugh Kenner wrote in his introduction to his edition of Pound’s translations. If we put a passage from Pound’s nô ‘beside . . . Cathay’ we ‘sense a remoteness’, Kenner thought, ‘a sense on Pound’s part that he is doing something exotic, thin, appreciated rather than lived, that just prevents the Noh sequence from standing, as Cathay does, with his finest original work’ (BK98). The nô is ‘as intense . . . as the ancient Greek drama of Athens’ and ‘unquestionably’ among ‘the great arts of the world’. Pound himself did not ‘put the [nô] work under the category of translation’ but believed rather that he was engaged in a ‘re-creation’ . Pound himself is responsible for some of this. Cathay appeared in April 1915, but that the nô was his greatest enthusiasm from the autumn of 1913 through 1916 is undeniable, and during this time Pound himself did not ‘put the [nô] work under the category of translation’ but believed rather that he was engaged in a ‘re-creation’ (59b). He wrote in 1914 that the nô is ‘as intense . . . as the ancient Greek drama of Athens’ (13b), and in 1915 placed it ‘unquestionably’ among ‘the great arts of the world’ (17b). Thrice between September 1914 and May 1915 he noted that the construction of the nô pointed the way to a ‘long imagiste or vorticist poem’ (12, 17f, 87), and by early 1916 he was writing enthusiastically to his parents that he was ‘doing some “Noh”’ of his own (70b and see also 81a-b), a comment one writer took in 1976 to be a reference to the early cantos (see 147), but in fact Pound, following Yeats (see especially BL12), was indeed doing some nô of his own, two comic fragments based on an understanding of the kyôgen (81c-d) and an adaptation of the legend of Tristan and Yseult closely modelled on the mugen nô (81f). Pound’s work with Fenollosa’s nô continued to appear through 1916, Awoi no Uye (Aoi no Ue) in the Quarterly Notebook of June (22), Kakitsuhata (Kakitsubata) in the August Drama (23), and finally in book form, first in September, at Yeats’s request, in Certain Noble Plays of Japan (21), and then in January 1917 in ‘Noh’ or Accomplishment (24), which collected the earlier-published re-creations and added fragmentary versions or synopses of several other plays. In 1916, a year after Cathay and some months after he had begun work on The Cantos, Pound turned his thoughts to the nô in a preface he had prepared for a reading of Alfred de Musset’s Supper at the House of Mademoiselle Rachel (81e). The plays provided a method for ‘reconstructing . . . the past’ that gave him ‘the closest parallel to [his] thought’, he wrote. By early 1917, however, something had changed. Pound had devoted the better part of three years to the work that appeared in Certain Nobles Plays and ‘Noh’ or Accomplishment, but the reviews were mixed. The London Nation wondered if ‘our own past [is] so empty a granary, that we must transplant an exclusive, hieratic, allegorical, and chaste Oriental drama of the fourteenth century to generate a new literature’ (92a), and an anonymous reviewer in Asiatic Review berated Pound for being ‘unacquainted with Japanese affairs’, denounced his ‘poetical licenses’, and enumerated his ‘errors’ (93a). Pound would have been stung by this. Cathay had generated its own controversies, but a prolonged chorus of praise in the avant-garde journals and letters from acquaintances had allowed him to dismiss as reactionary the odd faultfinding elsewhere. But beyond Yeats’s unrestrained enthusiasm (see especially BL11) and Eliot’s initial reaction the acquaintances Pound most would have liked to have approved were silent about his work with Fenollosa’s nô, and as the reviews came in even much of the praise would have put him off. O. W. Firkins in the New York Nation could not conceal his enthusiasm for the ‘spell’ of the ‘lyric modulations’ of Pound’s ‘plaintive rendering[s]’. They were ‘like the rosy wreath which Celia returned to Ben Johnson’, and led Firkins to wonder ‘how much of [the] fragrance is assignable to the rose, and how much to the lips that have breathed upon it in its passage’ (93g). This alone would have set Pound to wondering about the wisdom of what he had done. Pound’s own change of heart, following Eliot, 1917: ‘China is fundamental, Japan not’; the nô is ‘too damn soft’. By January 1917 he had begun to distance himself from his ‘Japanese things’, and to extol the virtues of a new method more closely allied with China. He called it ‘ideogramic’. Reacting not to the poems of Cathay but rather to the Fenollosa essay that later would see print as ‘The Chinese Written Character as a Medium for Poetry’ (32) Pound wrote to John Quinn two days before ‘Noh’ or Accomplishment appeared that he found ‘China . . . fundamental, Japan . . . not’. Japan was ‘a special interest, like Provence, or 12-13th century Italy (apart from Dante)’, but China was ‘solid’ (59e). Pound returned both to the point and to the metaphor in August, in review of Certain Noble Plays and ‘Noh’ or Accomplishment. The ‘Japanese stuff has not the solidity . . . of Rihaku’ (Li Po), he wrote in Little Review, and ‘is not so important as the Chinese’ (28), an assessment that no doubt contributed to Eliot’s abrupt volte-face about the work in the following months. To Iris Barry Pound wrote that he no longer ‘believed in’ nô. It was ‘too fuzzy and celtic, even too “90s”’ (83). And to Quinn again in June 1918 he wrote that ‘Noh’ or Accomplishment was ‘unsatisfactory’. Pound did not believe that ‘anyone else [would] come along to do a better book on Noh’, and he continued to find ‘beautiful bits in it’, but in the end it was ‘too damn soft’ (59f). Could Pound have been aware that Binyon’s young assistant at the British Museum had turned his attention from the Chinese to the Japanese classical literature? The lines contain, perhaps, a certain foreboding. Regarding the ‘better book on Noh’ could Pound have been aware by this date that Binyon’s young assistant at the British Museum, Arthur Waley, had turned his attention from the Chinese to the Japanese classical literature, and was preparing his own book on the nô? Waley’s first nô translations appeared in Transactions and Proceedings of the Japan Society in 1920, then in March 1921 Nô Plays of Japan (D26b), the most knowledgeable translation of the form to have appeared in a European language. In a bibliography Waley reviewed earlier translations and noted that ‘wherever Mr. Pound had adequate material to work upon he . . . used it admirably’, but beyond this Waley was dismissive. ‘Noh’ or Accomplishment, in spite of Pound’s admirable use of Fenollosa’s material, was ‘fragmentary and inaccurate’. Pound would have been stung again. He did not respond to Waley, and but for three allusions over the years (in 34, 38a, and 42) did not mention the nô again in print until 1938. In a rare turn to the plays in his correspondence of the period Pound wrote to Glenn Hughes in 1927 to inquire about whether a Japanese acquaintance of Hughes might be able to revise his nô work so that it would be ‘copper-bottomed and . . . correct in every way’. Pound himself ‘had not the philological competence necessary for an ultimate version’, he wrote, and so without a knowledgeable revision the work would remain but ‘scattered fragments left by a dead man, edited by a man ignorant of Japanese’ (59g). Important Pound scholars have written dismissively of Pound’s nô. Important Pound scholars, Donald Davie, Herbert Schneidau, and John Tytell, among others, often turning to these comments, have written dismissively of Pound’s nô (109, 110, 178), and others have in effect ignored it. The most influential study of Pound’s work, Kenner’s Pound Era (128) of 1971, devotes two of six hundred pages to the plays. And so the tradition of relegating the nô to a secondary status in the Pound canon has continued. Pound scholars know that ‘China is fundamental’, the nô ‘too damn soft’, and Pound’s work with it the ‘fragments [of] a dead man, edited by a man ignorant of Japanese’. To dismiss the work on the basis of Pound’s assessment of 1917, however, or even to elide it in a study of the important sources of Pound’s poetics and methods of representation, represents a serious misunderstanding. The first point to be made in this regard is that to read much into Pound’s distinctions between China and Japan during this period mistakes the degree of his understanding of either. Many sources were available, and Pound’s intuition about them was in particular matters remarkable. But particularly regarding Japan even the best of European and American scholarship was in its infancy, and Pound did not have information enough to draw extensive conclusions. Between 1915 and 1917 he understood bits and pieces, regarding particular conceptual principles in the nô more than any contemporary writer in English, but he was no expert nor claimed to be, the occasional overflowing of bravado aside. Pound knew more than most in Britain and the United States, and more of Japan than China, but rightly we do not read Cathay for its exacting scholarship, nor should we ‘Noh’ or Accomplishment, nor should we dismiss the importance of the nô in Pound’s work because for a time he believed it less ‘solid’ than Li Po. In the article ‘Chinese Poetry’ published in April 1918 (30), three years after Cathay, Pound mistakenly draws every example from the Japanese, and even twenty years later, in a chapter on Chinese history in Guide to Kulchur (45f), he admits that ‘to separate what is Chinese and what Japanese needs more knowledge’ than he has or is ‘ever likely to come by’, and adds not unreasonably that he is not alone, that virtually the whole of the West exists ‘in a thick fog of ignorance’ about both civilisations. A second point is closely related, and anticipated in Eliot’s 1918 turnabout regarding Pound’s work with the nô. The only evidence Eliot provides that ‘Noh’ or Accomplishment is less ‘solid’ than Cathay—note Pound’s metaphor in Eliot’s evaluation—is not about Pound’s nô but rather his audience. The ‘attitude’ of the nô plays ‘is less usual to us’ than that of the Chinese poems, Eliot wrote, and he was right. Pound in Cathay may have been ‘the inventor of Chinese poetry for our time’, as Eliot so famously put it a few years later (in 39), but the point addresses a stylistic and conceptual rather than a historical matter. Li Po and Wang Wei had been around in translation in England for more than a century. What is remarkable about Cathay is not that it brought Chinese classical verse to English—many other popular monographs published in London had done that—but that Pound was able to make the voices and stances and even the occasions of the poems resonate with contemporary European preoccupations, and in a contemporary idiom. But the nô was different. Pound himself had written in 1914 that it was among the ‘least known arts of the world’ (13a), and if the ‘world’ is accounted Europe and America this is correct. The first mention of the plays in a European publication, by Algernon Mitford, interpreter at the British Legation at Edo (see D4), appeared forty-two years before Pound received Fenollosa’s manuscripts. Fenollosa was the first American to discuss the nô in print, Pound the second, and it was largely his work that brought the plays to the attention of readers in Britain and the United States. The earliest English-language commentators on the nô had warned readers of the ‘peculiarity’ of its ‘manner of representing’, and its ‘extreme remoteness from everything to which we are accustomed’. But not only was the nô unfamiliar to British and American audiences. It was also, as Pound put it in 1915, among the ‘most recondite’ of the world’s arts (17b). He could bring voice to the Bowmen of Shu and England heard its sons at war in a far country and longing for home (‘Will we be let to go back in October?’), but how to bridge the conceptual gap that divides English from nô? Mitford was fluent in Japanese and aided by a helper trained in the tradition but had found the plays ‘utterly unintelligible’; Chamberlain, first professor of Japanese philology at the Imperial University at Tokyo, believed the ‘manner of representing’ in the nô so ‘peculiar’ that an accurate English version would be ‘impossible’; Aston, author of the first history of Japanese literature in a European language, was as puzzled by the plays as Mitford and as sure of the impossibility of their translation as Chamberlain; and Stopes, collaborator on the first monograph on the nô in English, found it necessary to forewarn her readers of ‘the extreme remoteness’ of the form ‘from everything to which we are accustomed’. Europeans were ‘still so bound by Aristotle and Aquinas’ that they could not accept the very different nature of the categories of perception implicit in the nô plays. Of those Pound most would have liked to have approved, only Yeats found the plays congenial, but he was no bellwether of popular taste. In the beginning Pound would not have been aware of what he was getting into, but then, extraordinarily, he was. Not many of his readers followed the intuition, however. The nô is a ‘form of perception’, Pound wrote in 1915, as ‘precise’ as any ‘scientist’s statement’, but Europeans were ‘still so bound by Aristotle and Aquinas’ that they could not accept the very different nature of the categories of perception implicit in the nô plays (87). Pound himself had found Takasago (88d), ‘incomprehensible’ until he began to understand its ‘perfect . . . construction’, which relied on a ‘sense of past time in the present’ unlike anything in European dramatic convention (88c). But how to bridge the gap? Yeats found the plays congenial because he perceived in them a parallel to the legends of the Irish countryside and his own preoccupations with the spirits of the dead ‘dreaming back’ their passions in the world of the living (see especially BL13), but few readers were so intimately acquainted with Swedenborg and Soho mediums, and in any case Yeats was no bellwether of popular taste. Most didn’t get it, or like Firkins got the wrong thing. The fact in the end is that most who read Pound’s nô simply did not understand it. ‘We in the West are not in a position . . . to arrive at a full appreciation’ (93e) one contemporary reviewer put it, another that the work is ‘alien to our habitual atmosphere of art’ (92a). This has not changed in significant ways through the years, even for many who have in influential ways turned attention to Pound’s work. In this regard it is true that his nô was unsuccessful. Whether the error lies in the work or the reader remains an open question, though, and in any case to say that Pound’s nô has not been widely understood is not to say that it did not figure in important ways in things to come. The idea that the nô was of minor importance to Pound has grown in part from lack of understanding of the nô itself, but it also misreads much of Pound. Between 1913 and 1916 he made large claims for the plays, and even as he expressed the doubts of 1917 he reserved praise for particular ‘bits’ of the work. Had he found nothing in Fenollosa’s notes but the ‘truly Homeric laughter’ at the end of Kagekiyo (21a), he wrote in his review of ‘Noh’, he ‘should have been well paid for the three years’ he devoted to the plays (28). The silence about them in following years represents disappointment in their reception, Pound’s inability to make them ‘copper-bottomed’, and many other preoccupations, but then his enthusiasm for the nô returned, one might say with a vengeance, sometime before Guide to Kulchur appeared in 1938. Pound’s interest in the nô re-emerges in Guide to Kulchur, his letters to Kitasono Katue, and his articles written as the unlikely ‘Italian Correspondent’ for the Japan Times of Tokyo. That work marks the re-emergence of the interest, in the chapters ‘Tradition, II’ and ‘Savoir Faire’ (45b and d), but in dozens of other instances between 1938 and 1942 Pound turned to the nô and his sense of its importance for the European tradition. During most of this time he was in Rapallo and cut off from sources of information of Britain and the United States, and from outlets for publication in English. Shortly before the war he had begun a correspondence with a young Japanese poet, Kitasono Katue, whose magazine VOU Pound greatly admired (see especially D29), and it was largely in correspondence with Kitasono and as the unlikely ‘Italian Correspondent’ for the Japan Times of Tokyo, a position arranged by Kitasono, that Pound set forth his views on the nô and much else during this period. As much of this writing as has been found has been collected by Kodama Sanehide in Ezra Pound and Japan (82), and other documents in which Pound turned to the nô during these years, transcripts of his broadcasts for Rome Radio, have been made available by Leonard W. Doob in “Ezra Pound Speaking” (76). What one comes away with in reading Pound on the nô in these volumes is unmistakably that he had come once again to believe that the plays represented something profoundly missing in Britain and the United States, but also, as in other matters, that his increasing isolation led finally to ideas obsessive and little short of delusional. Recurring themes are that the West needs a set of bilingual or trilingual editions of the nô (48, 49, 51, 82b5) and a set of films of the entire nô canon (49, 76e, 82b4, 82b14, 82e2), that Aoi no Ue, Kagekiyo, Kumasaka, and Nishikigi are of particular beauty (51, 53, 76b, 76e), that Kume, who had helped with the nô work of 1915, was well-remembered, well-loved, and badly missed (53, 55, 76e, 82b4), but also that the fourteenth-century Japanese drama demonstrated that twentieth-century Japan was a high civilisation wrongly forced into war (76b, 76c, 82d), and that the war itself might be brought to an end if only the United States and Japan might be persuaded to make a simple trade: Guam for ‘one set of color and sound films of the 300 best Noh dramas’ (76e, 82b14, 82d). Pound raised the issue quite seriously both on Rome Radio and in a letter to the Japanese Ambassador to Rome. No new insight into the nô is to be found in his writing of these years, only the renewed enthusiasm, and ultimately this would be of small significance but for one thing. Pound’s love of the nô and belief in its regenerative possibilities is still there, mitigated by loss and mediated in more remarkable ways, at Pisa. Donald Davie wrote in 1964 that Pound’s nô was a ‘blind alley’ (109), but what Davie could not see from where he stood was that twice thirty years apart that alley opened out into The Cantos. Pound told Donald Hall in 1960 that he began The Cantos ‘about 1904’, and Dorothy Shakespear refers to his ‘long poem’ in a letter of December 1911, but the best evidence is that Pound’s work on the poem we now call The Cantos began in 1915, at the height of his early infatuation with the nô. Pound told Donald Hall in 1960 that he began The Cantos ‘about 1904’ (68, p. 36), but his earliest unmistakable reference to the poem dates from 1915. In August he wrote to Alice Corbin Henderson that he was at work on ‘a poem which will resemble the Divina Commedia in length but in no other matter’ (88, p. 120), in September to Milton Bronner of his ‘cryselephantine poem of unmeasurable length’ (126, p. 184), and then in December to his father of the ‘big long endless poem’ (70a) he had begun. The ‘problem’ at the beginning, Pound told Hall, had been ‘to get a form—something elastic enough to take the necessary material’. There are indications that he worked to find this form for some time, and references that indicate abortive starts on the poem—Dorothy Shakespear refers to his ‘long poem’ in a letter of December 1911, for example (see 77, p. 82)—but the best evidence is that Pound’s work on the poem we now call The Cantos began in 1915, at the height of his early infatuation with the nô, and that for a time he believed he had found in the plays the form for which he had been searching. The earliest of Pound’s cantos to see publication, the ‘Three Cantos’ (27) that appeared in Poetry in the summer of 1917, arrived on Harriet Monroe’s desk accompanied by a letter from Pound in which he told Monroe that the work in progress would have ‘roughly the theme of [the nô play] Takasago’, and that he ‘hope[d] to incorporate more explicitly in a later part of the poem’ the ‘story’ of that play (70c). The theme of the nô in question is the mystical power and longevity of love (‘What thou lovest well remains’), and indeed Pound incorporated allusion to the story into the poem, both in canto IV (31) and the lyrical close of XXI (38). In both cases he set the purity of love represented in Takasago in counterpoint to European tales of spiritual corruption and brutality (see 31 and 38 for further commentary). The connection to the nô in ‘Three Cantos’ is more than thematic, however, and may be traced to Pound’s intuition of 1915 that the nô relies on a ‘sense of past time in the present’, and the understanding of 1916 that led him write that this method of ‘reconstructing the past’ provided the ‘closest parallel’ to his thought. The ‘Three Cantos’: ‘Ghosts move about me / Patched with histories.’ Despite the disparagements of Pound’s nô by a line of critics beginning with Eliot, others, including Ronald Bush and James Longenbach, have shown that Pound’s understanding of the nô instrumentally informed his earliest work on The Cantos. The first of the ‘Three Cantos’ opens with an invocation to Robert Browning about the historical methodology of Sordello, and includes key lines about Pound’s own methods that both Ronald Bush (145) and James Longenbach (183) have equated with the methods of the nô: ‘Ghosts move about me / Patched with histories’. In each of the ‘Three Cantos’ the voice of the Poundian persona, like the waki in the plays of the mugen nô, calls forth the spirits of the dead bound to a place sanctified by history and myth, Sirmio during the Italian Renaissance (I), the Dordogne Valley (II), the land of Circe and the underworld of the Nekuia (III), and as ‘Pass each in his appropriate robes’ (III), ‘Ancient in various days, long years between them’ (II), they emerge into the world of the poem, coming to life in what Peter Nicholls has called a ‘compound tense’ (204), Pound’s ‘sense of past time in the present’ that he had written underpinned the ‘perfect construction’ of the nô. The places themselves and the colours and moods associated with them provide the ‘unity of image’ Pound believed central to the nô and had written opened the way for a ‘long imagiste or vorticist poem’, and twice at key turns images from the nô plays themselves inform the lines. In the address to Browning in I the narrative voice explicitly becomes the redeeming angel of Hagoromo: ‘What’s left for me to do? / Whom shall I conjure up; who’s my Sordello, / . . . / Whom shall I hang my shimmering garment on / Who wear my feathery mantle, hagoromo . . . ?’; and in II, in a turn that foreshadows the use of the pines of Takasago in cantos IV and XXI, the nobility of the ghost of Kumasaka is set in counterpoint (and in super-position) to images of the corruption of El Cid and the Portuguese court of Afonso. In ‘Three Cantos’ a representational principle deriving from Pound’s work with the nô provides a means to infuse time present with the historical and mythological past, and the nô itself is a part of the mythos, representing an ideal of redemption in art and a nobility of spirit that is set beside manifestations of the gods of Tuscany, figures rising from the dismantled castles of Valencia, and ‘news of Troy’. The method of ‘Three Cantos’ is not the method of The Cantos, however, or at least not the cantos that followed for many years. Canto IV, with its recollection of the pines of Takasago, first appeared in print in 1919 (31), and in 1921 canto VII returns to understated allusion to the nô (see 34), but in these and other cantos of the period the explicit voice of the poet is subsumed in the text, and the settings that in ‘Three Cantos’ were explicitly imaginative—‘I walk Verona (I am here in England)’—are more directly (not to say conventionally) represented. Then in a 1925 revision that with minor exceptions established the text we now know as the beginning of The Cantos (35) the nô-like method and even allusion to the nô has disappeared from cantos I-III as well. The first-person voice, when it appears at all, but in passing at the beginning of canto II and the opening of III, Pound sitting on ‘the Dogana’s steps’ in Venice, is not the ‘I’ of the poet but rather of his characters, Odysseus, Acoetes, and others. The setting forth of the voices, the rapid movement from one to the next orchestrated by a disembodied narrator, reminds more of Eliot than of the nô. Of the ‘Three Cantos’ only the close of III, the Nekuia section, remains largely intact, and is provided primacy of place as the opening of the poem (‘And then went down to the ship’). The sacred places remain but more disparately so—Ithaca to Troy to Thebes to Venice and Burgos in nine pages, with a voyage toward Naxos on the way—and while the voices of the historical and mythical past still inhabit the lines the living voice in communion with them, which in the nô redeems ancient passions in time present, has disappeared. It is tempting to attribute this re-vision to Pound’s dissatisfaction with the nô after 1916, and surely this would have entered into the equation as the opening of the poem was recast, but other and better-known factors are important as well. Not least among these is that by the time of his revision Pound had encountered other models that suggested ways of binding together the disparate pieces of the poem, most notably in The Waste Land and Ulysses. If the nô had figured no more in The Cantos than the scattered predictive notes of 1915 and 1916 and the abandoned representational strategy of ‘Three Cantos’ it would amount to little but an interesting footnote. But at Pisa the invocatory voice returns, and the haunted imaginative space within which the spirits crowd round, and then again, more centrally than before a part of tone, theme, and the complex web of association of The Cantos, the nô returns to Pound after he has returned to the possibility of a Paradiso, in the final Drafts & Fragments of Cantos CX-CXVII (72). Pound’ s return to the ‘compound tense’ of the nô is marked in the first of The Pisan Cantos. The return to the ‘compound tense’ of the nô is marked in LXXIV, the first of The Pisan Cantos (56), by the re-emergence of Pound himself into the poem, and by the lines that characterised the method of ‘Three Cantos’, cut in the 1925 revision but recalled here, from the wreckage of Europe, after thirty years: ‘“Ghosts move about me” “patched with histories”’. The sacred place is Taishan, first among the holy peaks of China, source of life and the place to which the souls of the dead return, conflated with a peak visible to Pound on the horizon, ‘from the death cells in sight of Mt. Taishan @ Pisa’. Even more than in ‘Three Cantos’ the lines and the imaginative space from which they arise are haunted. In canto VI the story of Cunizza da Romano had been narrated, but at Pisa she appears in Pound’s room, watching. The mistresses of Sigismundo and Cavalcanti stand before him. Dionysus is hailed, welcomed, and directly addressed, Venus-Aphrodite invoked in his name, and the ‘new subtlety of eyes’ enters Pound’s tent. And in this haunted space Pound returns to the world in which he discovered it. The apparitions are often from the nô itself: Kannon, Buddhist goddess of compassion whom Pound first encountered in Tamura (LXXIV, LXXVII, and LXXXI); again the redeeming spirit of Hagoromo, come to Pound as a ‘corona of angels’ at sunset in the clouds banked on Taishan (LXXIV, LXXIX and LXXX); the ghosts of the warriors of Kagekiyo and Kumasaka (LXXIV); the safeguarding man/god of Suma Genji (LXXIV); the hannya of Aoi no Ue (LXXVII). As earlier in the poem manifestations from the nô are set in counterpoint to European tales of deceit—‘Greek rascality against Hagoromo / Kumasaka vs/ vulgarity’ (LXXIX)—but more than before they are interwoven into the associational texture of the poem. Kannon is conflated with Venus-Aphrodite, Suma Genji with the gods of Eleusis, the ‘nymph of Hagoromo’ presides over the central theme of divine incarnation and the central image of divine light. It is the imaginative space into which the apparitions enter, though, that most remarkably returns The Cantos to the nô. In a 1915 postscript to his re-creation of Fenollosa’s Suma Genji (17e) Pound wrote of the priest of that play that he sought ‘even in a vision’ to see ‘the beauty lost in the years’ and ‘the shadow of the past in bright form’. Of the dramatic construction of the play he wrote that it relies on ‘the suspense of waiting for a supernatural manifestation—which comes’. In both cases he might as well have been writing of The Pisan Cantos. Pound’s work at St. Elizabeth’s Hospital returned to the nô, in a translation ‘for Kitasono Katue’ and in lyrical passages in new cantos, but not in determinative ways. The cantos that follow those written at Pisa, published in Rock Drill (65) and Thrones (66), were written at St. Elizabeth’s Federal Hospital for the Insane in Washington, D.C. These consolidate historical and economic themes and twice in lyrical passages turn to the nô (see 64 and 66a), but not in crucial ways. Before returning to The Cantos at St. Elizabeth’s Pound had published a version of the Trachiniae ‘for Kitasono Katue’ that he hoped might be added to the repertoire of a nô troupe in Japan (see 61), but it is fittingly in the closing cantos, written after his return to Italy, that the nô returns most importantly to his work. The ‘presiding supernatural presence’ of Drafts and Fragments is the compound spirit who ‘clad in a memory’ dances and sings of the ‘ancient [but lost] splendours’ of love in the nô Kakistubata, and other presences from the nô illuminate the lines as well, and even more than Greek and Dantean themes provide the associational thread that binds the close of the poem together. The clearest understandings of this in the published record have been by Wendy Stallard Flory and Peter Stoicheff. The ‘presiding supernatural presence’ of Drafts and Fragments, Wendy Stallard Flory has demonstrated (see 186), is the compound spirit who ‘clad in a memory’ dances and sings of the ‘ancient [but lost] splendours’ of love in the nô Kakistubata (see 23), and other presences from the nô illuminate the lines as well, and even more than Greek and Dantean themes provide the associational thread that binds the close of the poem together. Kakitsubata’s tale of loss and redemption informs CX, the fragment CXV, and CXVI, and resonates throughout the sequence (see especially 72a, d, and e for commentary). The world of Aoi no Ue, haunted by a spirit of rancour so powerful it became manifest as a demon (see 22), is invoked in CX and echoes throughout the poem’s close, providing the central image of the central theme of the expiation of jealousy and hatred (see 72a, b, and c for commentary). Ono no Komachi, symbol in the Japanese tradition and in the nô of the ephemerality of beauty and the ravages of vanity and pride (see 17c-d), presides over those themes at the close of Pound’s poem as well, and conflated with Aoi and the moon represents as well the redemptive power of forgiveness (see 72a and e). Together these and other associations from the nô are central to the close of the poem, and therefore ultimately, retrospectively, instrumentally, to the larger universe of The Cantos itself. Peter Stoicheff, in the most detailed study to date of Drafts & Fragments (202), does not miss the point. At the close of The Cantos and nearing the close of his own life Pound identifies with the spirits from the nô, Narihira’s ‘My body / Is not my body, / But only a body grown old’, Kakitsubata’s contemplation of her own apparition on earth as ‘the cracked husk of the locust’ (both in 23), the longing to rectify the past of Nishikigi (8), the ‘beauty lost in years’ of Suma Genji (17e), the exorcism of jealousy of Aoi no Ue (22). Stoicheff’s comment on the closing lines of canto CX summarises the point: they return to the belief that respect and ritualistic prayer can transcend the pains of darkness, jealousy, self-recrimination, sin, and old age, as in their Noh counterparts, not beneath the poem’s foreseen paradisal culmination in the eternal light of the sun, but beneath the Noh moon that is its symbolic reversal, as Drafts & Fragments is The Cantos’ (p. 99). In the remarkable palimpsest that is The Cantos, texts inscribed upon texts, one erased to make room for the next, the nô must be seen to have been there all along. In the last complete canto, CXVI, Pound calls his poem a ‘palimpsest’. It is an apt metaphor. Seen in this way—texts inscribed upon texts, one erased to make room for the next—the nô must be seen to have been there all along, informing in its crucial way the beginning of the poem, put under erasure in 1925, and then re-inscribed, the text visible again through the pages and the years, transformed but unmistakably recognisable at Pisa, and then again, come full circle, at the poem’s close. In this regard one must take small exception to Stoicheff, or rather to his choice of a word, or rather to put his word itself under erasure and to inscribe over it another: the symbolic reversal of Drafts and Fragments at least in regard to the nô, perhaps in other ways yet unexamined, is also a symbolic return to the place the poem began half a century before, and it is in analysis of the nature of this returning, a reading of The Cantos against the text that was there all along, that the study of Pound’s debt to what he understood to be of Japan will most profitably go forward. It is mainly Pound’s nô that is mediated in Yeats, and then via Yeats passed along to others in such a way that the influence of one literary tradition on another finally appears to be little but a variation on the question of intertextuality. In addressing Pound and Japan even in an introductory way one important issue remains, the degree to which Pound’s Japan became the Japan of later poets and others in Britain and the United States. This perhaps as much as his own mediation of Japanese subjects places Pound at the centre of the study, and raises even more compelling questions about the nature of influence. The record in the matter is clear, even if it can only be outlined here. Regarding the nô Kodama Sanehide no doubt was correct when he wrote in 1994 that the versions of the plays that appeared in ‘Noh’ or Accomplishment remain ‘the most widely read and influential translations’ in any language (201, p. xi), in spite of the errors and oversights and omissions, in spite of Waley and a dozen later editions that are ‘copper bottomed’ (even if we no longer believe that a translation can be ‘correct in every way’). And it is mainly Pound’s nô that is mediated in Yeats, and then via Yeats passed along to Bottomley (CA3), Binyon (BC22), Sturge Moore (CA9), Eliot (CA10), Wallace Stevens (CA7), Robinson Jeffers (CA11), Paul Goodman (CA12), Kenneth Rexroth (CA13c), Ulick O’Connor, and others, and from each of these on to others, so that intermingled with the ‘influence of the nô’ on the English stage is Pound’s nô, with the slant of light that came to him from Fenollosa, who himself could not read the plays in Japanese, slanted further, and then further, and then again and again, until the influence of one literary tradition on another finally appears to be little but a variation on the question of intertextuality. Pound’s technique discovered in what was probably a French translation of hokku became Japanese poetry for British and American writers, who adopted it intact, in verse that has been argued to have been ‘influenced by Japan’. And who could disagree? Pound was among the most important of Japanese influences in English-language verse of the first half of the twentieth century. All men and plants are dead. It would be impossible to trace a text-by-text link between Pound and Carter’s Muneyuki, and it is possible even to imagine that Carter has not read Pound, but who cannot hear Pound’s voice in Carter’s representation of Muneyuki’s? The point could be made in regard to the English versions of virtually any classical Japanese poem pre- and post-‘Station of the Metro’, Cathay, and Lustra. Porter’s style was carried forth for a few years by stalwarts for whom poetry in English even if it represented poetry in Japanese meant rhyme and conventional metre, E. Powys Mathers (D25) and Miyamori Asatarô (D27), mainly, but the style was rendered archaic by Pound in a few months in 1915 and 1916, and what little resistance was mounted thereafter, which would have disappeared soon enough anyway, was dispatched quickly by Waley, who adopted Pound’s line in his translations of Chinese verse (see BH15), and then in 1919 in Japanese Poetry (D26a), and then in verse passages in Nô Plays of Japan and The Tale of Genji (D26c), and that was that. It would not be wrong in this regard to extend Eliot’s line about Cathay. Pound invented Japanese poetry for our time, too. But the point may be put differently, and should be, at a time when we know more about, or at least write more about, intertextuality. A more accurate way to say it is that Pound was among the most important of Japanese influences in English-language verse of the first half of the twentieth century. It is in part this sort of inversion, finally, that this Pound section and this bibliography in general tries to provide data enough to begin to be able to describe.